We live on a planet where every land has been divided into different parts known as countries. Now, let me ask you a question which is the happiest country in the world? The first thing that will come to your mind is that how we are going to rate it i.e. what will be parameters on which we can judge this. The answer is there is a life index rating done by the Organization for Economic Co-operation and Development or OECD. The more the life index the more the country is happy and satisfied. The report also has data for education, employment, life satisfaction, income, health, and the environment. Finland is the happiest country in the world. It has a happiness level rating of 7.632. The country is known for its smarter education system, cheaper health care, strong social network and better working conditions. Like other developed countries, Finland schools hours are much shorter but the quality of education is very high. Almost 83 per cent of the citizens is qualified with university-level degrees. The people of the country are very happy and living a high standard of life. The country has overtaken Norway to be the happiest country in the world. Also, Finland is widely considered as the best place to be a mother and a working woman. The country has a progressive taxation system and wealth redistribution so the lifestyle level between the rich and poor is not very divergent. Norway is also a beautiful country and it is rated among the happiest, safest, healthiest and well-educated countries in the world. The unemployment rate in the country is just 3.4 per cent. Norway citizens enjoy 5 weeks of holiday annually. The Norwegian Government is committed to providing a high standard of living for his citizens. Norway is also among the best places to see the northern lights. The crime rates in the country are extremely low and also Norway is among the least corrupted countries in the world. It is also one of the countries with longest coastlines. According to the world happiness report, Norway is performing well among the main factors of happiness such as caring, freedom, generosity, honesty, health, income and good governance. The country is famous for its beautiful landscape and enchanting animals. Denmark is the third happiest country in the world. The country is also top rated in various fields like security, trust, health, wealth, and education. The citizens of the country have a high level of trust among themselves. The government of the country is very transparent and always try to give his citizens a good life through various programs. They have a great sense of human equality. Copenhagen is one of the greenest countries in the world. The country is known for its togetherness, food and drink. The government of Denmark have high taxes but in return, they have healthy healthcare, social security and pension. Iceland is a landmark which has a rich, beautiful, peaceful and world-class system in the world. 80 per cent of the population has a paid job. The women are also very much satisfied in there security and jobs nearly 79 per cent of the women’s are employed. The crime rate in the country is also very low. The country has also one of the best gender equality. The first female president of Europe is also from Iceland. The average life of the people is 82 years. The citizens of Iceland are democratic socialist that means they pay heavy taxes but in return, they get Healthcare, Hospital/doctor appointment costs, Higher education, Maternity/Paternity leave and Daycare. The country is also famous for its social services because the country tries to take care of its people. Switzerland is the 5th happiest country in the world. The unemployment rate in the country is very less. The taxes in the country are very low and the wages are very high. The country is economically very strong. The citizens of the country do not work for long hours instead they spend time with family. They used to enjoy sports activities on a daily basis so that they can be fit and energetic. Being the happiest country in the world, Switzerland is known among travellers for its bungee jumps in the world. The country is known for its beautiful scenery, lakes and mountains. It has some of the best universities in the world and a stable political system. Also, it has satisfactory results in the healthcare system and low unemployment. So, if you want to live comfortably and conservatively, Switzerland is a perfect country. The Netherlands is also one of the happiest countries in the world. There is a very strong social network between the citizens of the people. The average life of the Dutch people is around 81 years. The country has one of the best healthcare systems in Europe. The country has one of the most tolerant histories and cultures. They are one of the greenest and one of the healthiest countries in the world. Also, it has the best social security systems in the world. Everyone is guaranteed 70% minimum wage. The Netherlands has one of the strongest pension funds and the economy is always robust. The schools and university are among the best in the world. Canada is the happiest country among all North American countries. The high wages of the country up to 30,000 Dollars indicates the higher living standards of Canadians. Almost 80 per cent of Canadians has their own home and automobiles. The rate of crime is very low and also Canada is among the least corrupt countries in the world. The government of Canada is very committed towards the development of its citizens and they always launched new programs for the development of the country. The country has outstanding facilities and infrastructure. It has the highest standards of living in the world. The low crime rate, diversity and respect for all people across the country are some of the parameters to be one of the happiest countries in the world. Also, it has a beautiful nature and landscapes. Taxes are high but citizens in return get free health care, maternity and paternity leave. New Zealand is among the safest countries in the world to live in. The life expectancy is above average. The country has one of the best education systems in the world. The people of the country are surrounded by properly-preserved beautiful landscapes and pretty well leaving a good life. It has some of the best snow-covered mountains and volcanic terrain to spectacular lakes and sandy beaches. Sweden has a very transparent country that is the one of the key reasoned one of the happiest countries of the world. During the elections, the voters turn out on a very large scale which signifies the trust of citizens in the government. The income of the citizens of the country is also one of the highest and 74 per cent of them have a paid job. The working hours in the country is low so that they can spend more time with their family and friends. Sweden has been named as one of the happiest countries in the world because of various reasons such as average GDP, safety against Crime, life Expectancy and low crime rate. The country has the perfect work-life balance and they are kind to themselves and everyone. Australia is one of the highest economic powers of the world with a GDP of 1.5 trillion US Dollars making it one of the happiest countries in the world. 74 per cent of Australians has a high school degree. The Australians are also known for their science programs and maths. The country has a high level of education that also attracts many foreigners in the country. There is a unique program in the schools of Australia known as a school to work in which students learn a working skill before they finish their degree. The country has a healthy work-life balance and zero stress levels. The life expectancies are among the highest in the world (82.15 years). The people of the country are quite friendly, however, the standard of living is not cheap. It has a nice seasonal rotation that makes the continent is one of the happiest places to live in. One of the happiest countries in the world is situated in the Middle East exactly on the southeastern shore of the Mediterranean Sea and the northern shore of the Red Sea. Officially known as the State of Israel with Hebrew and Arabic being the official language of the state. The geography of the country is very diverse with desert conditions in the south and snow-capped mountains in the north. The highest peak of Israel is Mount Meron with a height of 1,208 meters above the sea level. The most important river in the country is the Jordan that flows from the north through Lake Hule and Lake Kinneret and finally going into the Dead Sea. The happiest country in Central Europe known for its mountain villages, baroque city architecture and rugged alpine terrain. 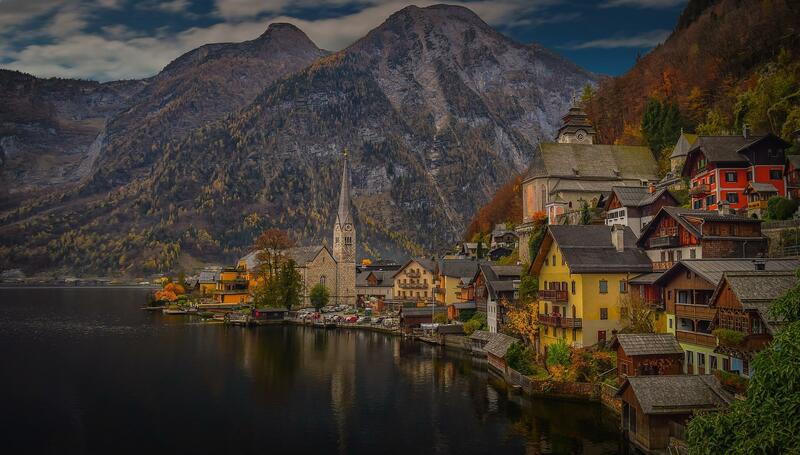 Officially known as the Republic of Austria with its official language being German. The capital of the country is in Vienna situated in the country’s east on the Danube River. The country is popular for a great variety of flora and fauna that includes various endemic species that are under preservation. One of the most forested countries in Europe with almost half of the country is under forest. The highest peak of the country is the Grossglockner with 3,798 meters, also being the highest point in the Alps. The rainforested Central American country is also the happiest country in the world with an index of 7.072. Officially known as the Republic of Costa Rica with the official language being the Spanish. The capital city is a San Jose is also known as Villa Nueva when it was settled in 1736. The highest point of the country is Cerro Chirripo at 3,820 meters is also the 5th highest peak in Central America. The island situated in the North Atlantic, howvever, it is is separated from Great Britain to its east by the North Channel, St George’s Channel and the Irish Sea. It is also called Éire in Irish and also known as the Republic of Ireland. The United Kingdom is the only country that bordered Ireland, however, rest of the island is surrounded by the Atlantic sea. The capital city of the country in Dublin and also the largest city in the country. The 5th largest country in Europe is also one of the happiest countries in the world with an index of 6.965. The official language of the country is German and in German, it is known as Deutschland. The capital of the country dates back to the 13th century and it is also the capital and cultural centre of the country. The other major cities of the country include Munich, Hamburg, Cologne, Stuttgart and Frankfurt. One of the countries with the largest forest cover provides natural habitation for a wide array of animal life. These are the 15 happiest countries in the world. Do post your comments.